This listing is for ONE cull Morgan Silver Dollar from 1878-1904 with a fully readable date (and mint mark if applicable) and no holes. The piece you will receive may have graffiti, scratches, rim damage, polish lines, have been previously cleaned or any combination thereof. None of our pieces we send out have holes or are bent. NO DATES ARE GUARANTEED, the piece you will receive will be selected at random during shipping. The photos provided may not be the exact coin pictured however it represents the same product. Please ask any questions prior to purchase. This listing is for ONE cull Morgan Silver Dollar from 1878-1904 with a fully readable date (and mint mark if applicable) and no holes. The piece you will receive may have graffiti, scratches, rim damage, polish lines, have been previously cleaned or any combination thereof. None of our pieces we send out have holes or are bent. NO DATES ARE GUARUNTEED, the piece you will receive will be selected at random during shipping. The photos provided may not be the exact coin pictured however it represents the same product. Please ask any questions prior to purchase. 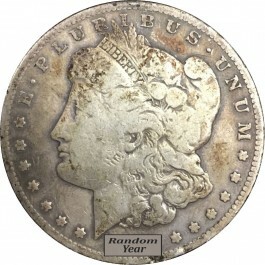 Morgan Dollars are silver dollars that were minted from 1878-1904, and resumed again in 1921 for that year only. They were the first standardized silver dollars following the production of the Seated Liberty pattern which ended in 1873 due to the Coinage Act of 1873. The Coinage Act of 1873 outlawed all holders of silver bullion to strike their silver into legal tender. In 1878, the Grand Bland Plan otherwise referred to as the ‘Bland-Allison Act’, was enacted to restore the silver dollar. The bill required the US Treasury Department to purchase between 2-4 million dollars worth of silver bullion and coin them into silver dollars. The fineness of these silver dollars became standardized at 412.5 grains of .900 fine silver, .100 copper, a net weight of .77344 ounces pure silver, and a total weight of 26.73 grams ( 0.942873 oz.) Morgan Dollars as they became known, were designed and named after by the United States Mint assistant engraver George T. Morgan. Morgan’s design featured a profiled bust of Liberty on the obverse and an eagle with outstretched wings on the reverse. Furthermore, dates were struck below the bust of liberty and mint marks (when present) are below the wreath on the reverse. George T. Morgan’s last initial (M) can be found at the truncation of the neck. His last initial (M) is also found on the reverse on the left hand loop of the ribbon.